During the 1930's, a military kennel named the Red Star, out of Moscow, started working on a native breed that would be part of the national security force. Attempting to create the breed at that time was quite a challenge due to the slaughter of much of the purebred dog stock during the Russian Revolution, and additional depletion of pure stock during the World War and economic disasters. Their breeding program came to life after World War II, when quality Giant Schnauzer and Rottweiler stock were brought back to Russia. The Red Star Kennel worked on selective interbreeding using Giant Schnauzer, Rottweiler, Airedale and Newfoundland breeds. All in all, a total of 17 breeds were used to create the Black Russian Terrier. It was important to have a large breed, not only reliable but highly trainable in many different situations. The dog would also have to be able to endure the harsh Russian winters. The dogs were initially used by the military police at border crossings, prisons, and military installations. By 1956, it finally reached the point where the Black Russian Terrier bred true, and the Red Star Kennel released dogs to private breeders. The first breed standard was created by the Red Army in 1958, and was revised several times before 1981. In 1981, the Russian Ministry of Agriculture recognized the breed and it was internationally accepted by the FCI (Federation Cynologique Internationale) in 1984. BRTs came to the US in the 1980s. In 2001, the Black Russian Terrier was admitted to the Miscellaneous Class of the AKC and was accepted into the AKC Working Group on July 1, 2004. The Black Russian Terrier is a robust, large and very powerful dog. The dog has large bone and well developed muscles. They range in size from 26 inches to 30 inches, although some can be a little larger and weigh between 80 and 130 pounds on average. 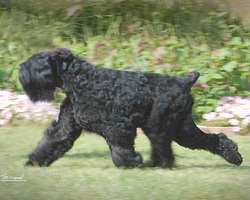 The Black Russian Terrier comes in one color only....black. A few grey hairs (even in puppies) are allowed as long as there are no solid patches. No color other than black is acceptable.